The Cumberland & Dumfriesshire Farmers Mart P.L.C. 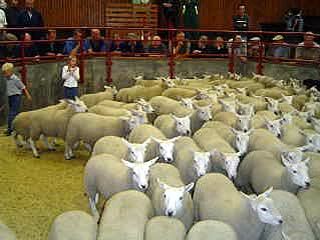 had forward 6,018 store lambs (including 2,242 Cheviots) at their sale on Tuesday 6th October 2009. A large good quality show met the dearest trade so far this season. Top of £55.20 for Suffolks from High House, others £53.80 Borthwick Brae, £53.50 Clarghyll; Texel £54 Mossband House, £53.80 Ramshope, £53.20 Gatehousecote; Charollais £53 Boghall, £50 Leahill; Greyface £52.50 Lynnshield, £51.80 Old Hall; Beltex £52.50 Old Hall Farm; North Country Cheviot £49.50 Meiklewhitriggs; Blackface £49.50 Horseholme, £47 Dunblane, £44 Lamperts; Swaledale £30 Cumstone. There was also 2,242 Hill Cheviots forward, trade was the liveliest of the season. Top of £47 Windyhaugh, £45 Crossdykes, £43.20 Tushielaw, £42.80 Parkhill. Cast ewes to £67.50 for Suffolks from Old Hall; Blackface £44.50 East Steel.